Italy’s Best gives you the chance to enjoy a pizza and gelato making lesson in the heart of Rome. Have you ever want to learn the secrets of making pizza and gelato like an expert? You’ll spend five hours making pizza and gelato – two of Italy’s most iconic culinary delights. In the hands of Italy’s Best’s English-speaking food expert, you’ll be guided step by step in the creation of your own pizza and gelato. Learn the tricks of the trade in this fun and delicious experience meant to give you the skills necessary to master pizza and gelato making. At the end of this exclusive Rome cooking class, you will enjoy eating your very own creations of homemade pizza and gelato. 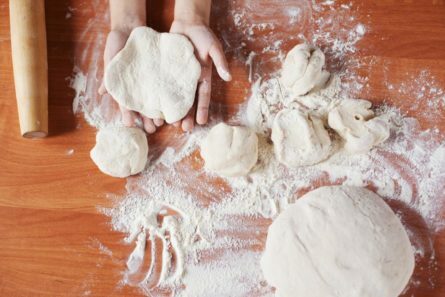 First, you’ll learn how to mix, knead and roll out pizza dough followed by topping the pizza with fresh, local ingredients. Learn the different types of classic Italian pizzas – Margherita, Napoli, Capricciosa – and select your ingredients to customize your own pizza after kneading and rolling out your pizza dough. You’ll learn about the importance of the impasto (dough), how Roman and Neopolitan pizza differ, and the importance of wood burning ovens. These key aspects will help you understand how to perfect your pizza making and create your own custom pizza during your lesson. Next we skip toward dessert, learning how to make gelato and sorbet. You will learn how to blend the fruit and mix the final ingredients to create your own delicious frozen treat. Flavors include vanilla, chocolate, hazelnut, and seasonal fruit flavors. You will also learn the best flavor combinations and how ingredients are sourced for the freshest, seasonal gelato. After your lesson, you’ll also understand the differences between Italian gelato and American ice cream. Specific flavor requests are also welcome.